When I lived in the South I loved fall. Now that I live in the North? Fall in the South means glorious days in the 80's, then 70's, then 60's, then 50's . . .
And it lasts forever. Like months. Fall in Michigan can be lovely, too. And wine tastings . . .
All three weeks of it. Then it just gets cold. This year I have made a concerted effort to relax and not let fall freak me out so much. And it's been a nice one. Which has given me one last chance to do the things I didn't get done over the summer. 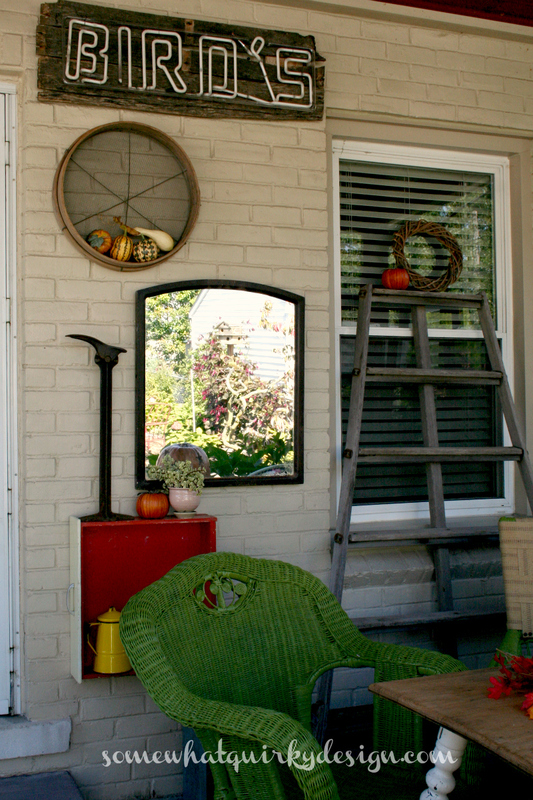 Like put up a gallery wall on my back porch. I had been wanting to finally use this neon sign that I bought at a yard sale 2 summers ago. Have you figured out yet that it takes me about 2 years to get anything started? It took me about 10 minutes to get these really crooked pallet boards screwed together, and about 5 minutes to wire this old neon light to it. So this project took me 2 years and 15 minutes to complete. All of the other stuff came from trash picking and cheap sales. 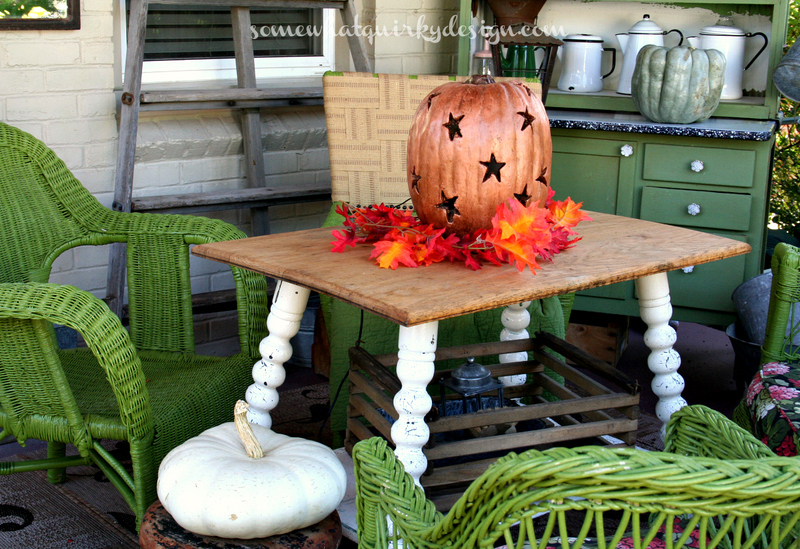 Except for the big pumpkins, which are heavy, I used fake stuff because the squirrels that think they own the back porch would think I was feeding them. 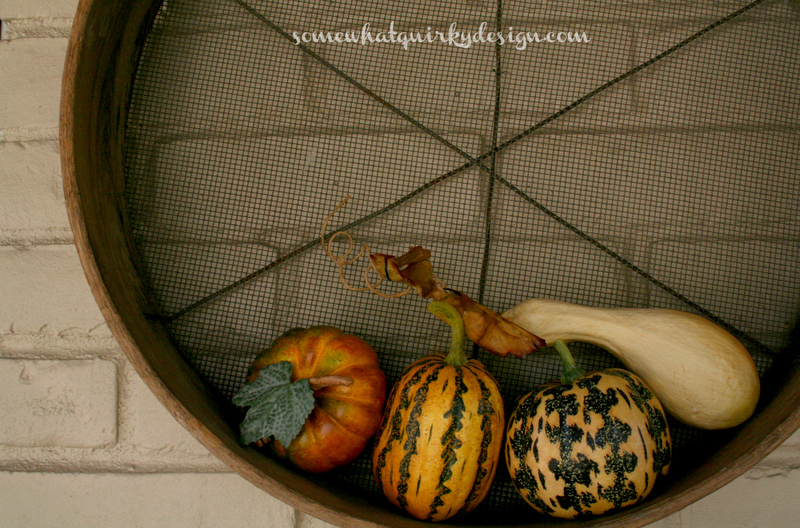 I decorate this seed sifter for fall and again for Christmas. It works as a really great wreath I think. 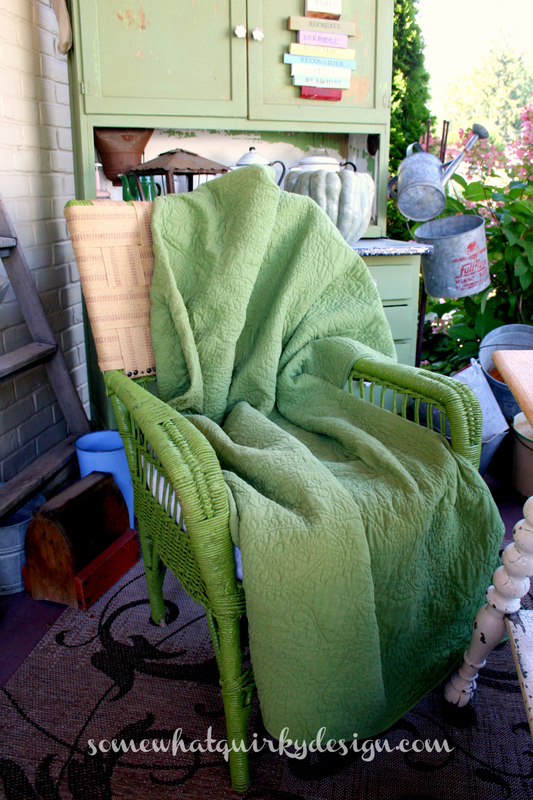 The chair that I was redoing never quite got finished. I was busy making cushions for someone else . . . So its cushion is going commando. I protect its modesty with a quilt - which the squirrels ate a hole into. I used the pumpkin I painted last year. The squirrels can't ruin that. It lights up and that's fun. I like my outdoor gallery wall. But I have one question . . .
What do you think I should put in that awkward empty space above the mirror and to the right of the seed sifter? This is your chance to tell me what to do. You may never get the chance again. So help a girl out. The left side of the door belongs to my favorite project ever. I think I've told you that before. Maybe four or five times. 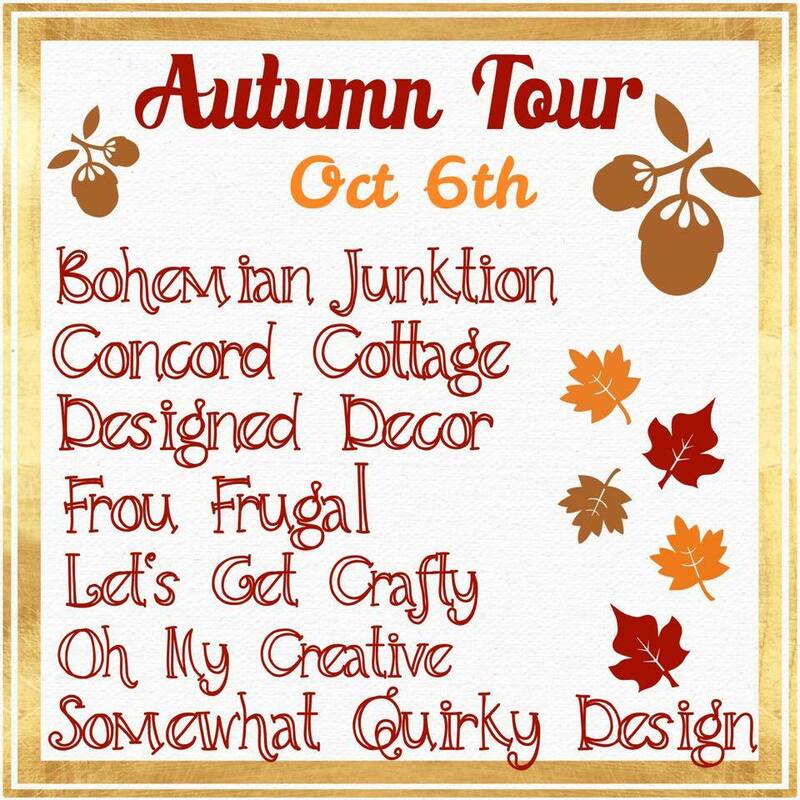 Some of you may be visiting from a "Fall Tour" that I'm participating in with some blogger friends. Have a seat and stay awhile. Not all my cushions are commando. 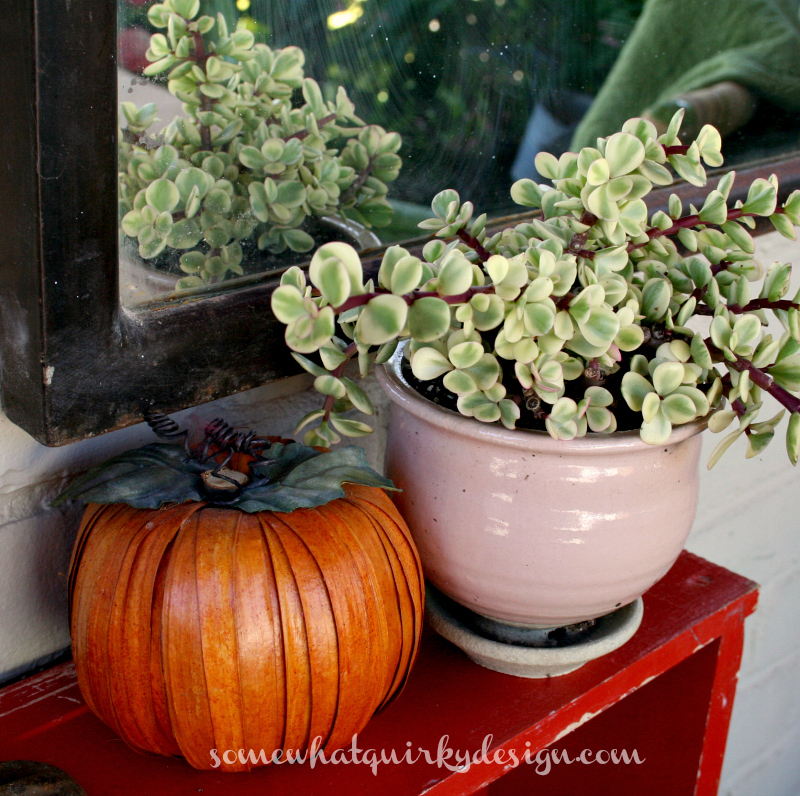 If you're not - well I'd love for you to check out the fall projects my girls are sharing today. They aren't just blogger friends, I've met them all, and they're some dang good people, too! I hope you find something inspiring here! 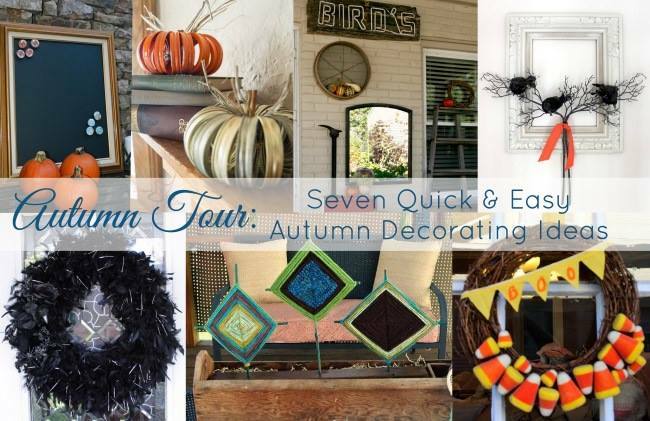 Just click on each picture to see what projects they have to share with you! Tell them I sent you! I love this space! I WANT that ladder! I will be up to get it soon! 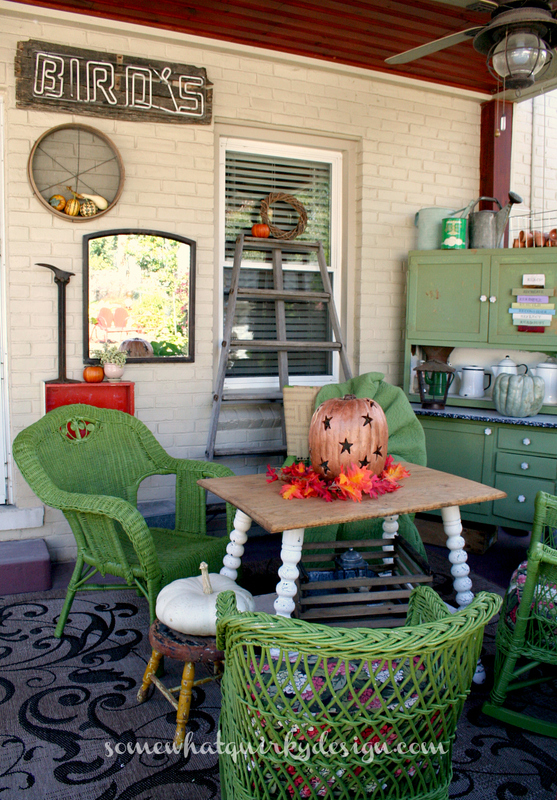 Your porch is so cute. I love the neon sign. You can use it year around. 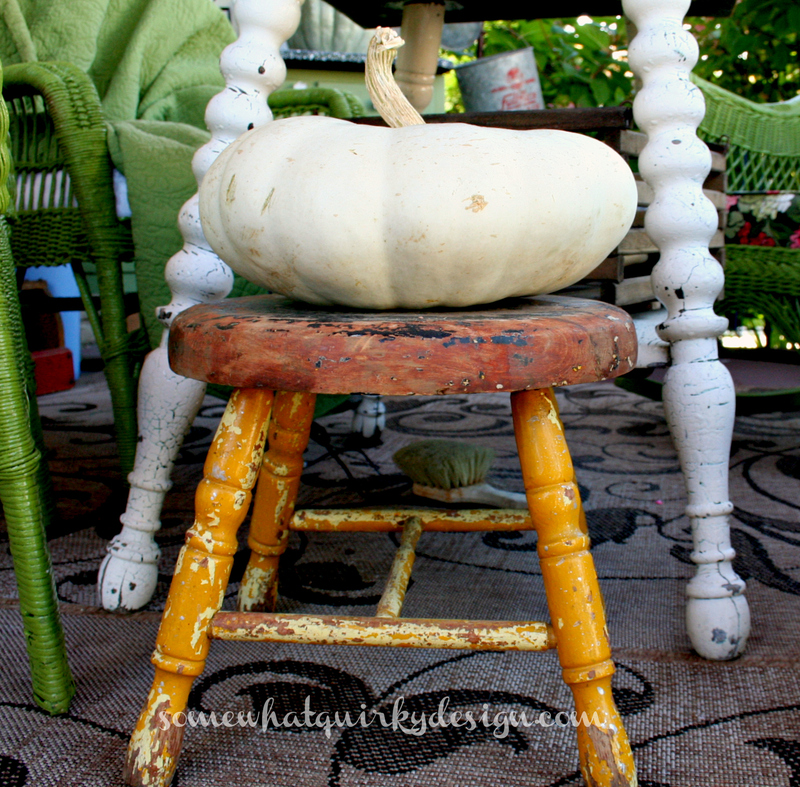 Plus that little stool with the pumpkin is adorable with it's worn character. You rocked it. Don't forget your wine glass for the fall wine tastings! You are SO funny, I was laughing throughout this post. (Those rude squirrels!) And I liked you before but now that I know it takes you 2 years to finish a project I think I love you hahaha Hey. Your gallery wall looks fabulous, I'm so glad you finally got that cool sign up too. 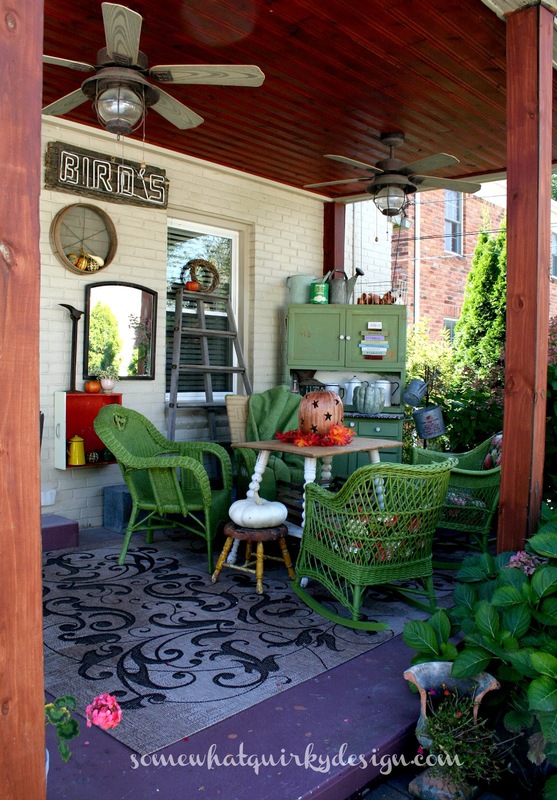 Seriously, I wish I had a porch, I'd want it to look like yours. I just hope the weather stays nice for you. ps. 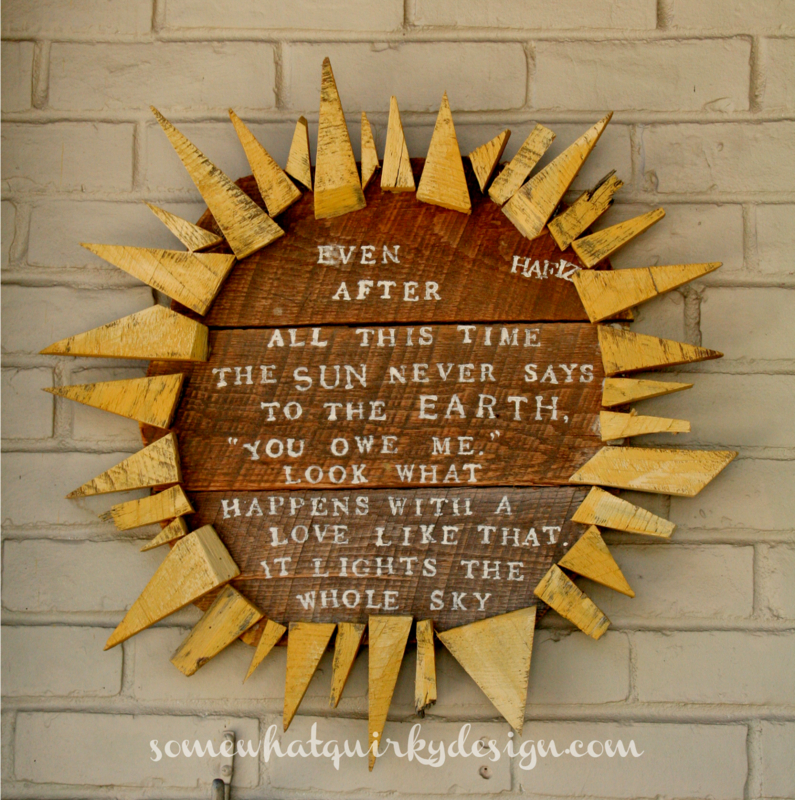 that is the sweetest quote on your sun garden art. one more thing I love. 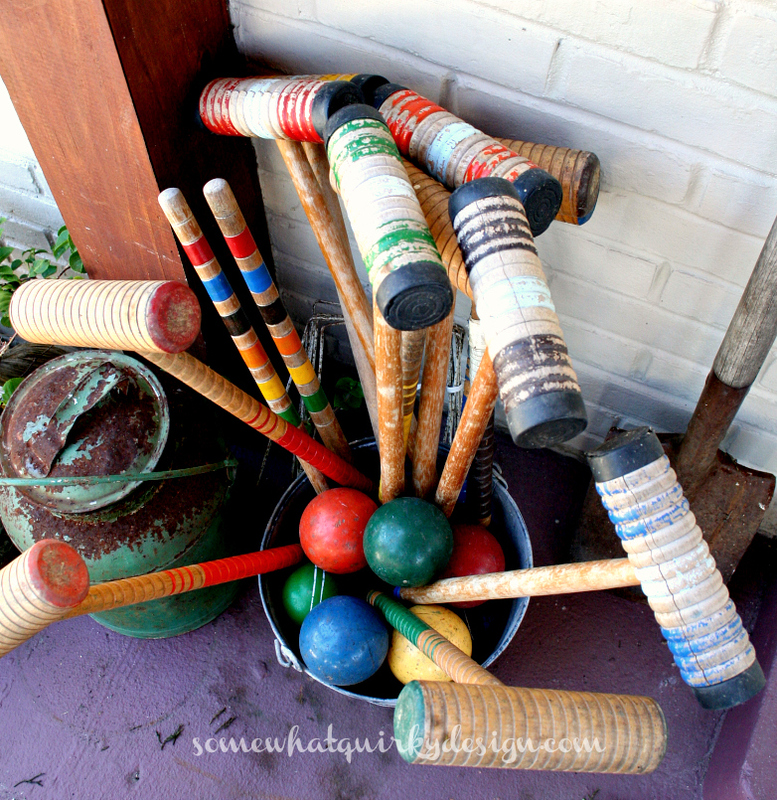 What a fun porch Karen! I love that neon sign. Maybe a wreath would be good in your bare spot? 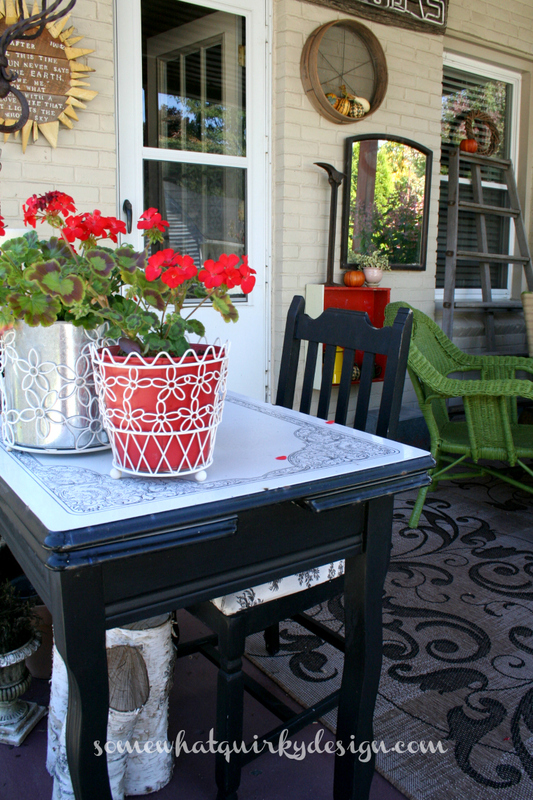 Your porch is looking awesome (again)! I can't believe they ate a hole in the quilt. Jerks. Very cool neon sign...I'm glad you found a space for it. I'd say a letter. A black letter K for Karen. And this was really a funny post you know.... and I keep time like you when it comes to getting stuff done. I love your decor and the sign is awesome. This is gorgeous, Karen. The squirrels rearrange a lot of my porch decor also. For that spot: what about going to the thrift store, finding some wild random kid's toy and spray painting it all one coordinating color and hanging it up? You asked: "What do you think I should put in that awkward empty space above the mirror and to the right of the seed sifter?" How about a big wad of indian corn to drive the squirrels nuts? Make it FAKE indian corn! I love squirrels, and where I live in this little piece of North Carolina, we don't see any. We find them in other neighborhoods, but not ours. We used to live in Ohio, and there were scads of them - all year around! You have a beautiful porch. 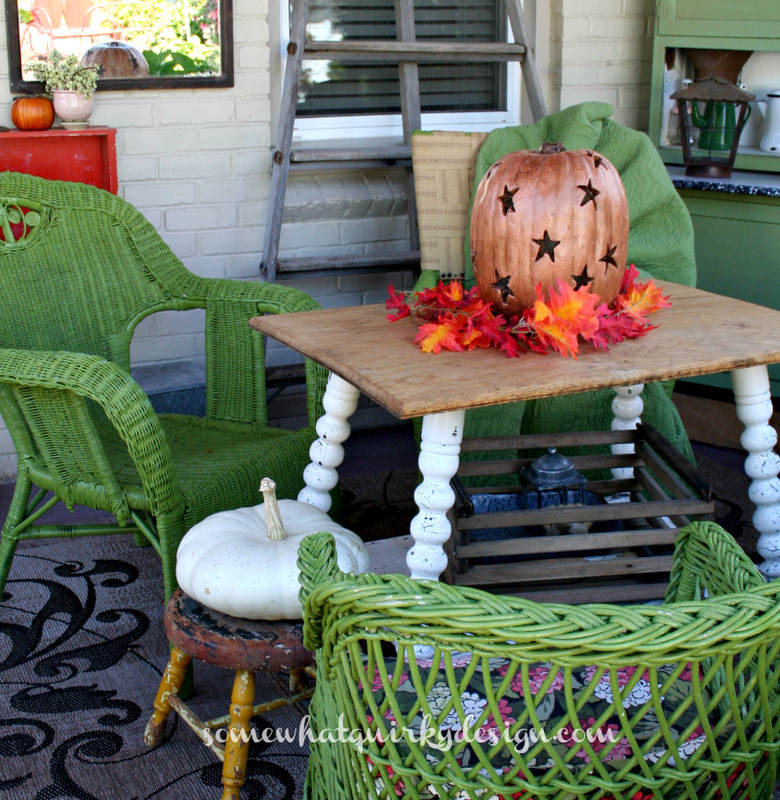 I love it all, even the nekid chairs. I must have those squirrels West Coast cousins living here. They are a nuisance. I am thinking of resorting to fake flowers for my wheel barrow planter too so the deer don't feast on my display! I love all those photos. What a wonderful way to protray this time of year!